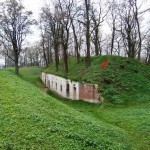 The first fortifications on the hill above Łętownia were carried out during the Crimean War, between 1854 and 1855. Austria, fearing war with Russia, fortified the passageways through the rivers San and Dniestr. The earth work nr. 4 had an octagon outline. A wooden blockhouse, which served as barrack for 80 men, was placed in the centre. After the tension between the two nations ceased, the area of the temporary fortification was sold. The next phase of fortifying Przemyśl came in 1878. Although the project of rebuilding earthwork nr. 4 was completed, it was not realized due to financial constraints. 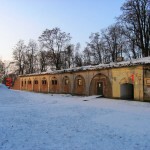 In 1880 the Ministry of War chose Przemyśl as a camping place for the field army, fortified with permanent fortifications. Lagerfort VIII ‘Łętownia’, which was supposed to close the biggest gap on the left bank of the river San, was the first one to be built. The construction works started in the second half of 1881 and were finished in 1882. 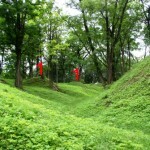 The main task of the fort was to control the area in the San valley, where the route leading to the Dukla Pass was located. The fort had a pentagon outline, where the barracks served as the gorge side. On the Verdeck there was an infantry position. A moat was placed in front of the artillery earthwork, which was protected by three concrete caponiers and the moat at the gorge was additionally protected by a wall with embrasures. 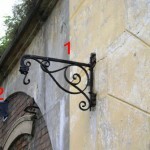 The caponiers were only armed with rifles, while behind the wall in the gorge two old 15 cm leichte Granatkanonen were placed. Inside the moat there was a brick wall about 5 m high, which served as an additional obstacle. The open artillery positions placed in the front and flank section of the earthwork were divided by traverses. 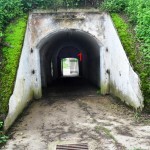 Inside them were concrete shelters for the cannon crew and ammunition storages. 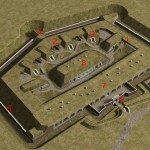 The fort’s main ammunition storage was placed in its centre. Eight 12 cm M. 61 and four 10 cm M. 63 muzzle loader cannons were initially chosen as armament. Over time some of the armaments were altered. 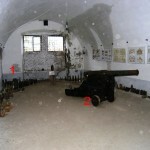 In 1914 and 1915 during the fights around Przemysl it is most likely that all of the artillery was moved outside the fort. The command post of the Łętownia group was stationed in the object. Beside fort VIII ‘Łętownia’ the group consisted of fort VIIIa ‘Leśniczówka-Łętownia’, fort VIIIb ‘Kuńkowce’ and the ‘Łętownia’ infantry strongpoint. 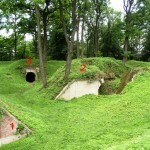 Several trench lines extended between the forts. On the 22nd of March, 1915, during the capitulation of the Festung Przemysel, the caponiers and emergency shelters on the flanks of the fort were blown up by the Austrians. 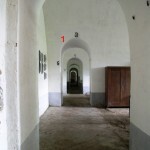 During the period between the wars, the preserved barracks and the ammunition storage were used as a storehouse for artillery rounds. After September 1939, the fort was used by German units. 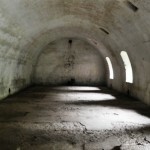 Following the Second World War the fort was used as a storehouse for a winery. This caused serious damages to the old buildings – the brick walls were pierced in order to install big wine barrels. Since the year 2000 the fort is mainly used for touristic purposes. The adaptation of two casemates and some reconstructions were done by volunteers. Zu der ersten feldmäßigen Befestigung des Łętownia Hügel kam es während des Krim Krieges 1854/55. 1881/82 wurde an derselben Stelle das permanente Fort VIII Łętownia errichtet. Seine Hauptaufgabe war die Kontrolle des San Tales im Bereich der Straße zum Dukla Pass. Das Werk hatte einen pentagonalen Grundriss, und der umlaufende Graben wurde durch 3 Kaponieren bestrichen. Die 10 offenen Batteriestellungen waren durch Hohltraversen strukturiert In der Mitte des Werkes stand das Hauptmunitionsmagazin. Am Verdeck der Kehlkaserne befand sich eine Infanterieverteidigung. Während der Kämpfe 1914/15 wurde das Werk wahrscheinlich desarmiert und die Geschütze außerhalb des Werkes in Stellung gebracht. Bei der Kapitulation am 22.3.1915 wurde das Werk teilweise gesprengt. Nach dem ersten Weltkrieg fand das Werk Verwendung als Munitionsmagazin und nach 1945 als Weinlager. Derzeit wird es touristisch genutzt und teilweise renoviert. Von Przemysel kommend folgt man der Grunwaldzka Straße in Richtung Dynow. Straße Nr. 884. Im Ort Kunkowce biegt man rechts in die Gürtel Straße ab und folgt dieser für ca. 2 km. Fallweise gibt es Hinweisschilder. From Przemysl follow the Grunwaldzka street in direction of Dynow. Road number 884. In the village Kunkowce you have to turn right and then follow the Gürtel street for about 2 km. There fort is signposted a couple of times. At the top of the hill is fort VIII.